One of the smaller music halls in London, the Boyston Assembly Rooms were situated over an auction house on Boyston Road. 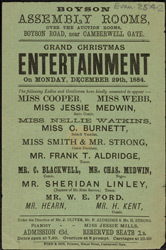 Theatre was one of the most popular forms of entertainment available to the Victorians, and music hall or variety productions were affordable alternatives to 'legitimate' theatre. There were many music halls in London, all competing with one another. They varied in décor, repertoire and audience, but they all served food and alcohol and provided a cheap night's entertainment.